Barry Ward & Yvonne Thompson’s vegetable growing started out as a hobby (for their own consumption) but then they realised they were actually quite good at it, and in 1984 they went professional. The two of them farm 3.2 acres of land in Poulton-le-Fylde, Lancashire, with about 1000 square metres under cover. The soil is a very fine sandy loam, easy to work when dry but prone to waterlogging in winter. To maintain bio-diversity in the soil and immediate environment, crops are grown on a rotation basis, this also helps keep a balance of flora/fauna in the soil, as does the absence of ‘man-made’ chemicals. “Supplying customers such as Unicorn who buy a good selection helps keep this diversity of crops. 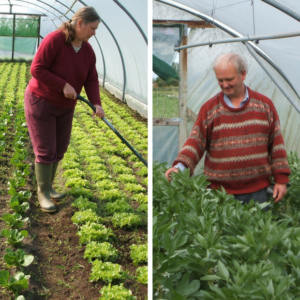 It also helps to know that our produce is going to an appreciative buying public who seek out good quality, locally produced foods.” Look out for their fine produce including lettuces, radishes, chard, and courgettes, peppers & chillies in the summer. Back to fruit & veg page.